There are high levels of worklessness in West Cumbria, and 1 in 4 adults in Copeland have no qualifications. One social enterprise in Cleator Moor is trying to address this issue by providing training opportunities to local residents. 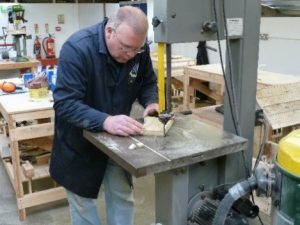 Since 2014, Home to Work on Ennerdale Road, has received £78,000 from different funds including the Shepley Group Fund funding towards its ‘Skills 4 You’ project, which uses woodcraft and upcycling/craft programmes to engage people furthest from the labour market, in practical and sociable activity. The project supports people who have a chronic lack of confidence underpinned by many mental and physical health challenges. Some have issues with drugs and alcohol, some are single parents, carers or ex-offenders, and others have been unemployed for many years. The eight-week training course gives groups of up to 10 unemployed adults the opportunity to learn woodworking and crafting skills in an on-site workshop over 16 hours per week. Alongside practical training, the course offers mentoring; support in writing CVs and interview techniques as well as looking at the social aspects of life which can support mental health and wellbeing. A further 26 weeks of post support helps to identify employment, volunteering or further training opportunities. Mark Conway, 42 lives in Egremont and was referred to Skills 4 You after being unemployed for many years due to a serious illness. He completed the eight-week Wood programme, stayed on as a volunteer then completed the eight-week Upcycling/Craft programme. Mark felt he was too old and that nobody would employ him due to his sickness record and not having suitable qualifications. He had 1:1 sessions with Inspira and Skills 4 You staff to support him in his journey back into employment. Confident in using the tools and machinery, Mark said: “Out of all the products I have made, I have enjoyed making the tool box and toy box the most as it is more of a challenge for me and there is a lot more measuring involved.” He even built a bespoke shed for Age UK. As well as providing practical skills and support, Skills 4 You also work with individuals to encourage a change of thinking: like learning to problem-solve or to get rid of self-defeating thoughts. Mark regained his positivity and confidence to apply for work and has now found employment at Sellafield with Nowercross Construction Ltd. Since the project began, 71% of the clients supported by the project have gone on into volunteering, employment, training or further education. Items made or refurbished during the training courses are sold; any profit goes to support an emergency fund to help clients purchase clothing for interviews, transport costs and other necessary items.